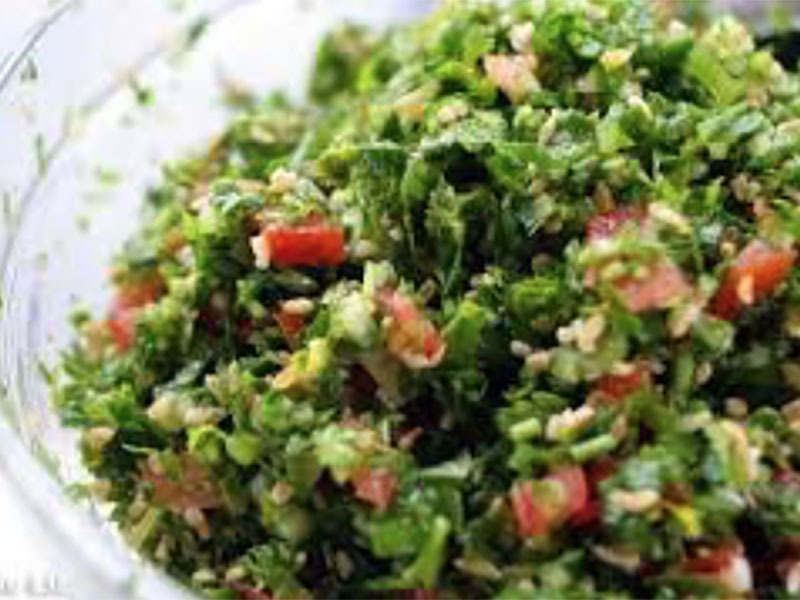 Tabouleh comes in all shapes and colours. Bulgar/cracked wheat is a must, as is enough flat leaf parsley to ‘green it up’. Apart from that it’s a fairly open house and can change with the seasons. Mini cucumbers and cherry tomatoes are Riverford Organics summer specialties so there’s no reason to stray too far from the norm. 1Mix the bulgar with 10mls of the oil and a good pinch of salt. Pour over 300mls of boiling water, stir once and cover the bowl with cling film. Leave for ten minutes, remove film and fluff up with a fork.Chop the tomatoes, spring onions and cucumbers. 2De-stalk and roughly chop the herbs. 3Mix the oil, lemon juice, preserved lemon and harissa. Give it a good blast of freshly ground black pepper. 4Gently mix everything together twenty minutes before serving.